Sailing from Copenhagen, our first port of call is Wehrnemunde in Germany. Part seaside resort, part port, its situation at the mouth of the Warnow river makes it convenient for the main municipal centre of Rostock seven miles to the south. The more ambitious take the train to Berlin, just two hours further on. The quayside is bustling with the Tall Ships race. Thousands have come to experience the poetry of sailing ships, to see blue skies punctuated by towering masts. Ferries scurry across the estuary, trains trundle in and out, pedestrians swarm amongst the stalls and rigged ships. 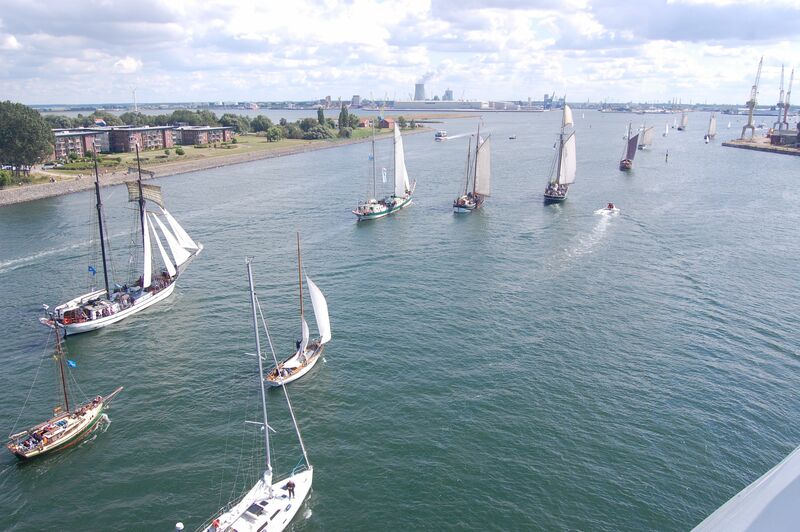 There is a regular parade of white sails along the channnel to and from Rostock. The estuary is a startling panorama of towering skies, modern industry and ancient maritime elegance. Somehow serenity pervades over chaos, the German devotion to form emerges ultimate victor. Yet charm is nurtured by bright sunshine, smiles break out everywhere. We take a morning train into Rostock, while the region’s population, I reckon, is taking the opposite direction out towards the Tall Ships. Some soccer game is also drawing rowdy supporters through the transport system, their bark worse than their bight, I daresay. 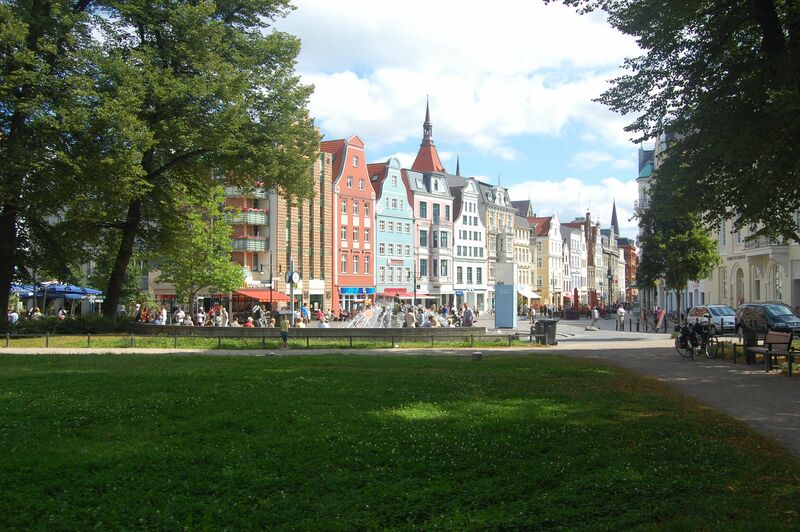 Rostock itself is quiet in the noonday sun. It is a small medieval jewel, large portions of the original city walls and turreted gatehouses surviving time and war, while the gothic cathedral of Saint Marian casts its extravagant shape over all. From the airy expanse of the New Market Square with its ancient Town Hall we flow along winding pedestrianised streets, the maritime theme echoed in galleon fronted houses and the occasional glimpses of blue water dotted with an endless variety of craft. Shopping and tourism are beginning to bustle and we find some respite in the thirteenth century Convent of St. Catherine, its contemplative gardens melting green in the shadow of the crumbling city walls. Rostock University is one of the oldest in the world. Founded in 1419, the main buildings now quietly survey the town centre, where Kropeliner Strasse widens into a casual plaza. Here an amusing focal point is provided by a fountain called Zest for Life. Amongst the university’s alumni is Tycho Brahe, the Danish astronomer who studied and lost his nose there. It was replaced, apparently, by a prosthetic made of gold. The astronomer’s observational powers were harnessed by Kepler, helping him to the ultimate model of the solar system. Something of this endeavour is echoed on the seafront back in Warnemunde. A scale model of the sun and planets is spread out along the seafront promenade. Not that we can find it on our return. With all the madding crowds, I can only find the sun, which is easy enough, parked obviously as it is at the Teapot centre. This modernist commercial unit is somewhat at odds with the older, more picturesque urban architecture of the town. It is thought to resemble a teapot. I doubt the Germans drink much tea. A celtic rock band plays nearby, a peculiarly appropriate blend of the Gaelic and Germanic. We feel we’re blending right in. There’s plenty of craft and souvenir shopping along chintzy streets lined with timber cottages. There’s all the fun of the seaside, sticky confections, fizzy drinks and wasps. You can rent out curious beach furniture, giant wicker hybrids of an easy chair and a beach hut. These are scattered on the sands like some surreal visitation. Wehrnemunde is still throbbing in sunshine and festivities. Parallel with the quayside there is a picturesque canal which serves much of the pleasure cruise trade. It is lined with bars and restaurants, filling now as we slip into the Baltic evening. We take a pew, our very own cushion clad, wicker two-seater. Here we sip our frothy beer, sit and watch the world go by, for ever and ever.